Columbia, Mo. 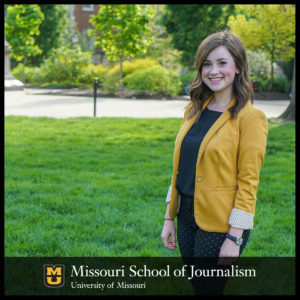 (May 23, 2017) — Missouri School of Journalism freshman Caroline Dade was recently named the Outstanding First-Year Discovery Fellow by the University of Missouri Honors College. Dade, from Rogersville, Missouri, is a Walter Williams Scholar, a by-invitation group for freshmen with a score of 33 or higher on the ACT. She plans to study radio-television journalism. Journalism freshman Caroline Dade was recently named the Outstanding First-Year Discovery Fellow by the University of Missouri Honors College. The Discovery Fellows are part of the MU research community of leading-edge faculty, scholars and researchers. They work on projects in their academic discipline, meet other students and faculty who share similar interests, and use these experiences to help pave the way for future research projects. Selected students work approximately eight hours per week during the academic year. Fellows are awarded a scholarship of $2,000 for the year. Dade is working with Assistant Professor Brett Johnson on research focused on gathering information about how different TV stations decide to use user-generated content in their newscasts and on their websites. Of special interest are policies that may govern the use of user-generated content, from those that stem from corporate policies that affect a group of stations nationwide to the beliefs and practices of the news director at a single station. The goal is to compare the data from the surveys to identify platforms, common trends, usage patterns and the role user-generated content plays in the creation of stories. Kent Collins, chair of the radio-television journalism faculty group, is working with Dade and Johnson to administer a survey to news professionals. Dade worked as a KOMU-8 news production assistant throughout the school year. KOMU, mid-Missouri’s NBC affiliate, is the only university-owned commercial TV station in the U.S. that uses its newsroom as a working lab for journalism students. Dade is an officer in Kappa Alpha Theta and is a member of Mizzou Alumni Association Student Board and Tour Team.